The exhibition celebrating Charlotte Perriand at the Fondation Louis Vuitton is ambitious not only in its scope, but also in its premise. While Charlotte Perriand is recognized as a leading figure in 20th century design, this exhibition presents her as a truly visionary woman who actively engaged with 20th century society, creating iconic elements for a distinctively modern art de vivre while at the same time helping redefine artistic and intellectual interactions. She was an exceptional personality, a woman committed to leading a veritable evolution, or perhaps more aptly, a revolution. Her keen observation and vision of the world and its cultural and artistic expressions place her at the heart of a new order that introduced new relationships between the arts themselves – from architecture and painting to sculpture – as well as between the world’s most diverse cultures, from Asia (Japan, Vietnam and other countries) to Latin America, notably Brazil. Her work resonated with changes in the social and political order, the evolution of the role of women and changes in attitudes towards urban living. She embodied a transition from 19th century traditions towards the contemporary model of the 20th century, scarred by the cataclysms unleashed by totalitarian regimes and world wars, followed by both physical and moral reconstruction. 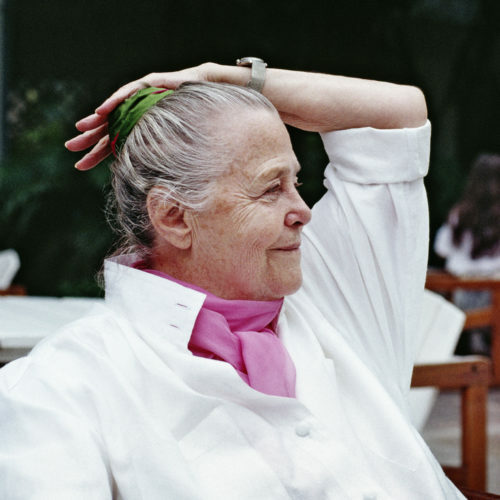 To mark the twentieth anniversary of the death of Charlotte Perriand (1903-1999), the Fondation Louis Vuitton will hold a major exhibition of her work exploring the links between art, architecture and design. A pioneer of modernity, architect and designer Charlotte Perriand is known in particular for her seminal contribution to design. The Foundation invites visitors on a journey through the 20th century spanning all its galleries in the company of an exceptional woman committed to defining an entirely new art de vivre. The exhibition retraces the architectural work of Charlotte Perriand, whose creations presage current conversations about the roles of women and nature in our society. Visitors will have a unique opportunity to engage directly with a world of modernity thanks to meticulously researched, faithful reconstitutions that include works of art chosen by Charlotte Perriand, thus embodying her vision of a “synthesis of the arts”. Through this exhibition, the work of Charlotte Perriand invites us to rethink the role of art in our society. More than simply an object of pleasure, art is the spearhead of profound transformations in the society of tomorrow. The pool level will be dedicated to the invention of a modernity that oscillates between a fascination for industry, political engagement and the imperative of reconnecting with nature. Beginning in the 1920s, Charlotte Perriand imagined an “art de vivre” that broke with the codes of her era. Finding inspiration in the worlds of automobiles and cinema and rethinking the role of women, she designed strikingly modern chrome tube furniture for her Saint-Sulpice studio (1927) and began researching a project entitled “Work & Sport” (1927) to illustrate her vision of the modern apartment. An associate of Le Corbusier and Pierre Jeanneret, she collaborated with them in designing icons such as the “chaise longue” and the “fauteuil grand confort” armchair for an “ideal apartment”, presenting them at the 1929 Salon d’Automne. Recognizing the drawbacks of contemporary design dedicated solely to functionality, in the 1930s she showed a greater affinity with nature and called for a renewal of living spaces. Decrying “the great misery of Paris” in terms of housing, she proposed a Maison du Jeune Homme (House for a Young Man, 1935), a space bathed in light and interspersed with art works, objets trouvés and contemporary furniture. A look at her “L’Art Brut” photographs alongside drawings by Fernand Leger reveals a nature whose force inspired her to create her first “free form” furniture with their organic curves. Invited to Japan in 1940 to advise the country on industrial arts, she presented an exhibition called “Selection-Tradition-Creation” (Gallery 4), a manifesto for rethinking living spaces and using traditional materials such as bamboo. She influenced an entire generation of Japanese designers while herself finding fresh sources of inspiration in the culture. Following the Liberation of France she took part in the Reconstruction, calling on artists including Fernand Leger, Pablo Picasso and Alexandre Calder to contribute to her projects. In 1947, Elle magazine named her “Minister of Reconstruction” in an imagined government of women. The rooms she designed for the Maison du Mexique (1952) and the Maison de la Tunisie (1952) student housing units in Paris illustrate her approach to minimal spaces and the intimate integration of furniture, architecture and art. Her Reconstruction was of course physical, but at the same time metaphorical, aimed at providing men and women with an indispensable sense of renewal following the trauma of war. Her window revealing a drawing by Picasso (for Paul Nelson’s “Maison Familiale Minimum”, 1947), her selection of “useful forms” for an exhibition at the Musée des Arts Décoratifs (1949-1950), and the open kitchen she designed for the Unité d’Habitation housing development in Marseille, are all emblematic of the poetic function Charlotte Perriand sought to bring to living spaces. The continuity between Art and Architecture was embodied in the exhibition “Proposal for a Synthesis of the Arts”, which opened in Tokyo in 1955 (Gallery 5). For the occasion Charlotte Perriand renewed her longstanding association with Fernand Léger and Le Corbusier, as well as with Hans Hartung and Pierre Soulages, designing a space that brings together paintings, sculptures, tapestries, furniture and architecture, thus effectively eliminating the boundaries between disciplines. Her goal was to transform the quotidian thanks to the arts by creating a new relationship with the world, enriched with new social interactions and fewer barriers and designed to awaken the senses. This utopian proposition is championed in Paris by the Galerie Steph Simon (Gallery 6), which offers creations emblematic of Charlotte Perriand’s distinctive art de vivre. The home she designed in Rio (Gallery 7) illustrates the capacity for constant renewal that this indefatigable creator exhibited throughout her career, always remaining faithful to her principles: design useful forms and integrate both cutting-edge technologies and the savoir-faire of different cultures. The upper level of the Foundation will present some lesser-known aspects of Charlotte Perriand’s work, in particular her contribution to museums and private collectors (Gallery 9). Furniture and fittings for the Musée National d’Art Moderne (1965), the apartment of collector Maurice Jardot (1978) and the redesign of the Galerie Louise Leiris (1989) all define spaces that invite a dialogue between visitors and the works. Charlotte Perriand was also a great “builder”. Interested in prefabrication from the 1930s onward, she designed the “Refuge Tonneau” (1938) with Pierre Jeanneret, both a shelter and an invitation to travel. This love of nature and the mountains explains the force and discretion of the architecture Charlotte Perriand conceived for the ski resort Les Arcs in Savoie (1967-1989). Each of the buildings is integrated in the slopes with singular ingenuity, offering occupants spaces for rest as well as contemplation of the spectacular landscapes of the Alpine peaks (Gallery 10). The last gallery in this remarkable itinerary (Gallery 11) invites visitors to meditate on the place of nature and the importance of dialogue among cultures with the Maison de Thé (1993), created for UNESCO and presented alongside works by Japanese artists such as Sofu Teshigahara and Isao Domoto. The scientific committee of the exhibition is composed of five curators: Jacques Barsac, Sébastien Cherruet, Gladys Fabre, Sébastien Gokalp and Pernette Perriand; Arthur Rüegg acted as scientific advisor for the reconstructions. Fondation Louis Vuitton particularly thanks Cassina for their precious contribution to the reconstruction of the Salon d’Automne and the loan of the Refuge Tonneau, as well as the authentic reissue of the furniture by Le Corbusier, Pierre Jeanneret and Charlotte Perriand. Fondation Louis Vuitton would like to thank all the lenders who made this exhibition possible : Archives Charlotte Perriand, Musée Maurice Jardot, Musée National Fernand Léger, Centre Georges Pompidou, Fondation Le Corbusier, Galerie Louise Leiris, Musée d’Histoire Naturelle, Mori Art Museum, Mobilier National, Musée Reina Sofia, Bibliothèque Nationale de France, Fondation Beyeler, Musée Picasso, MoMA, Centre National des Arts Plastiques, Collection Taisei, Dallas Museum, Fondation Hartung Bergman, Gothenburg Museum, Musée Kröller-Müller, Zürich Kunsthauss, Metropolitan Museum of Art, Museum of Modern Art, Hayaman, Musée d’Art Moderne, Saint Etienne, Musée des Beaux-Arts de Saint-Lô, Musée du Quai Branly, Musée Granet, Musée Picasso, Antibes, Musée Pierre Soulages, Frieder Burda Museum, Musée d’art contemporain, Tokyo, Fondation Broad Art, Fondation Isamu Noguchi, Musée de la Photographie, Chalon-sur-Saône, Musée des Beaux-Arts, Chaux de fonds, Collection of Fondation Louis Vuitton and Private Collections.